Do you want to try playing the PS4 and Xbox One but can’t afford hundreds of dollars right now? Are you looking for birthday ideas for your kids here in Sioux City? No Problem, we have you covered! At Game Lair, we offer “Battle Cages”. What’s the Battle Cage? 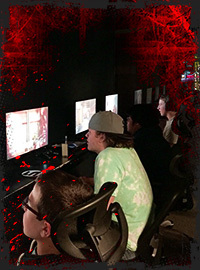 The Battle Cage is a gaming arena where we hold weekly events and daily live play. We are equipped with multiple Xbox Ones and PS4 systems. Whether it is a birthday party, tournament, leagues or just you and your girlfriend looking for something to do…try playing in the Battle Cage! Interested in testing your skills against local opponents? Check out our Tournament schedule for the latest upcoming events.